If you have a vision or dream for what time want your ceremony to be, pursue that! Consider the season, month and day of the week when you are planning a time. Much to consider. Think about your guests, the number of attendees, any special needs etc. Think about photography and videography for the ceremony time. Consider parking and accessibility for the time of the ceremony at any location. If you are having a reception, make sure that you can execute the timing of that close to your beach wedding ceremony time. This is one of the most important moments in your life. If you have a mental picture of hat it should be, then pursue that dream or option! Look at tons of photos. Find the vibe or aesthetic that you love. Look at our Facebook. If have picked a date, talk with your planner about various start times during the day. 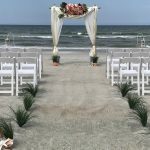 If you are firmly set on a sunrise or close to sunset beach wedding, make sure that that vision works with all other planning details. Much more about this coming up. Tell story about 2pm start on Saturday, in the summer, in busiest spot, at high tide. What month of the year is it? Is it in the late spring or summer? . Sunrises in east, we are on east coast. Spectacular results are possible. Weddings can start as late as 7-7:30pm. Sweet photography – we do get color in the east on many nights! All day to prepare, hair, makeup etc. Is your date in the fall? More flexibility on ceremony time. Near sunset gets earlier so 4 & 5pm weddings are optimum. Afternoon weddings are more attractive since the temps are cooler and the beach is not as busy as summer time. Is your date in the Winter? Much, much smaller beach crowds. Sometimes empty! 3) Think about your guests, the number of attendees, any special needs etc. How large is the guest list and what are the logistics of getting everyone to the location. Do you have disabled or older guests who have optimum times during theday that works for them? Do you have many guests that would have to take time off of work for a morning or daytime wedding, even on the weekend? If you have a large bridal party, consider the total time it will take for hair, makeup and getting dressed for everyone, then add more time because it will take longer than you think! We will have a whole show soon on the number one issue with beach/destination weddings. Late starts and delays. 4) Think about photography and videography for the ceremony time. Incredibly important to plan properly for treasured memories of your beach wedding. This means wedding photography and video. Dramatic sunrise or sunset photography, is this your vision? You need professional photography, experienced in beach weddings. Beach weddings can typically have bright sun conditions that will create shadows. Very important to use professional photography at all times, but especially in these conditions. The brighter the time of day, the more difficult the photography. Low to mid tide, with tide going out are always better ceremony times in general for beautiful setups and photography for same reason as previous point. Videography has the same challenges as photography as light is everything, but video lights are rarely ever used so pick a time where natural light is still available for good results. If you want drone video, which is amazing, the same principal as in the previous point applies. 5) Consider parking and accessibility for the time of the ceremony at any location. Afternoon weddings ok, but only in certain locations. In Volusia County, you can drive your car on half of our beach, so this may be the best parking scenario in some instances. Currently $20 per car however. You may need to consider shuttle transportation if your ceremony time is such that the location would would have limited parking , or if the guests would be better off not trying to drive (like if pregaming) or they don’t have transportation because they flew into the area and dont have a rental car. 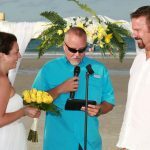 6) If you are having a reception, make sure that you can execute the timing of that close to your beach wedding ceremony time. As always the reception venue is the number one item to secure on your wedding date & time. Make sure that the start time of your reception works seamlessly with your wedding ceremony time. This would include if you plan a hors d’oeuvres and or cocktail hour. For sunrise or mid morning weddings consider a breakfast/brunch food option for the reception. Lower cost and super. If you want alcohol served, consider Bloody Mary & Mimosa Bars! Early Afternoon weddings are not ideal for receptions. An unusual time for food. Odd for Children and seniors as well. Evening weddings always work well with a reception to follow as it is dinner time, and people have already had meals throughout the day. As always, hire a planner who can take all the pressure off and advise you of the best way to put the ceremony & reception together. If you have a vision or dream for what time want your ceremony to be, pursue that! This is the most important item. Think about your guests, the number of attendees, any special needs etc.. This is a extremely important and sometimes tricky task. Think about photography and videography for the ceremony time. Only use professionals and ask for advise. Consider parking and accessibility for the time of the ceremony at any location. Very important for local weddings. 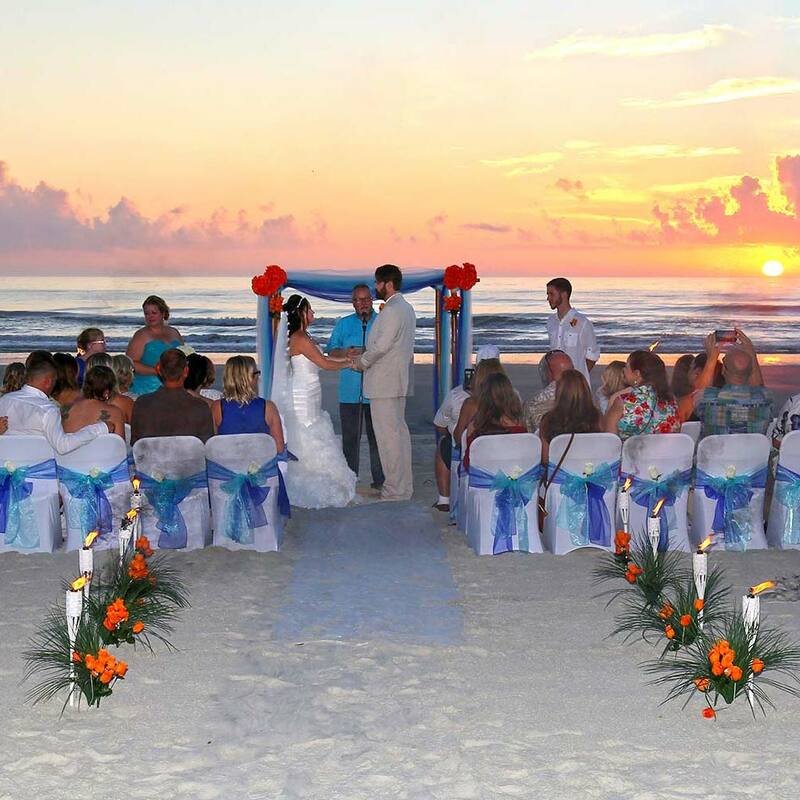 If you are having a reception, make sure that you can execute the timing of that close to your beach wedding ceremony time. Let a highly rated planner make this easy for you.